School board members dug into the budget on Wednesday night to gain a better understanding of the district’s current and projected financial reality. It was the third is a series of budget meetings held this winter to help board member’s establish budget priorities as it plans for the future. Watch the video. What they’re discovering is no big surprise, but it is a concerning trend impacting districts across the state. At the start of the next school year, projections show the district will be spending about $2.4 million more than it will bring in as revenue. By the end of the 2021-2022 school year, if nothing is done to increase revenue or reduce expenditures, the district’s fund balance will be completely depleted. Read more. The Pony traveled across the country and around the world last week as students enjoyed spring break with their families and friends. 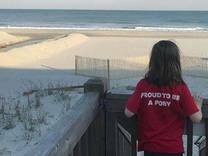 One student showed off her pony pride in Myrtle Beach, South Carolina while seeing the ocean for the very first time. See even more photos on Facebook. The e-newsletter you're reading was just ranked the #3 most helpful method of communication in the district! That's according to the 930 parents who responded to the recent Parent Communication Survey. We’ve just begun the work of digging through the results, reading all of the responses, and analyzing the data. We’ll be sharing more about the results - and our plans to use your feedback to develop new strategies for communication - with all of you in the coming weeks. Thanks to all who participated. We appreciate your honest and constructive feedback. Tickets are now on sale for the musical Bye Bye Birdie. Come see 50s heartthrob Conrad Birdie before he's drafted into the Army! Performances will be held at SAHS April 6-8. You can now purchase tickets online and reserve your seat at showtix4u.com. Board members voted to approve a purchase agreement for a new bus terminal. As part of the 2015 bond referendum, voters approved purchasing a bus terminal instead of leasing space - which saves general fund dollars each year that can go toward student learning. While the bond earmarked $3.5 million toward the cost of a terminal, additional interest earnings and savings when the bonds were sold will make up the remaining $1.5 million toward the property sale price. Bond dollars can only be used for projects outlined in the referendum and cannot be used for other expenses in the district, such as to hire staff.